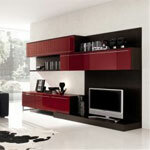 Create a wall unit to fit any size wall. 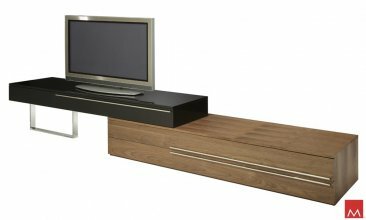 The Gramercy TV stand offers a new creative perspective where the boundaries of materials, colors, and innovation merge. The Gramercy combines a wood base with a lacquered mezzanine supported by a stainless steel leg. Lengthen (up to 148") or shorten (down to 95") the overall unit by adjusting the position of the mezzanine unit, allowing you great flexibility to accommodate any wall size. Base features two pull-out drawers, while mezzanine features one single drawer. Drawers features European soft closure hardware preventing loud and damaging closings. Available in two-tone combinations, including wenge wood/beige lacquer and walnut wood/black lacquer. Hardwood construction. Imported.